For more than nine hours I sat and watched a film named "Shoah," and when it was over, I sat for a while longer and simply stared into space, trying to understand my emotions. I had seen a memory of the most debased chapter in human history. But I had also seen a film that affirmed life so passionately that I did not know where to turn with my confused feelings. There is no proper response to this film. It is an enormous fact, a 550-minute howl of pain and anger in the face of genocide. It is one of the noblest films ever made. They talk and talk. 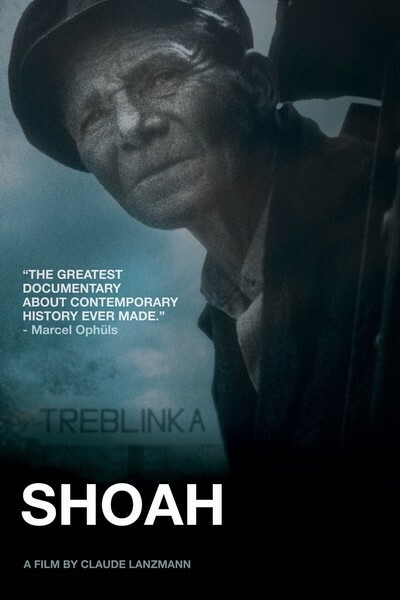 "Shoah" is a torrent of words, and yet the overwhelming impression, when it is over, is one of silence. Lanzmann intercuts two kinds of images. He shows the faces of his witnesses. And then he uses quiet pastoral scenes of the places where the deaths took place. Steam engines move massively through the Polish countryside, down the same tracks where trains took countless Jews, gypsies, Poles, homosexuals and other so-called undesirables to their deaths. Cameras pan silently across pastures, while we learn that underneath the tranquility are mass graves. Sometimes the image is of a group of people, gathered in a doorway, or in front of a church, or in a restaurant kitchen. You cut with what? With scissors? You said there were about 16 barbers? You cut the hair of how many women in one batch? A. "I can't. It's too horrible. Please." Q. We have to do it. You know it. A. I won't be able to do it. Q. You have to do it. I know it's very hard. I know and I apologize. A. Don't make me go on, please. Q. Please. We must go on. Lanzmann is cruel, but he is correct. He must go on. It is necessary to make this record before all of those who were witnesses to the Holocaust have died. His methods in obtaining the interviews were sometimes underhanded. He uses a concealed television camera to record the faces of some of the old Nazi officials whom he interviews, and we look over the shoulders of the TV technicians in a van parked outside the buildings where they live. We see the old men nonchalantly pulling down charts from the wall to explain the layout of a death camp, and we hear their voices, and at one point when a Nazi asks for reassurance that the conversation is private, Lanzmann provides it. He will go to any length to obtain this testimony. He does not, however, make any attempt to arrange his material into a chronology, an objective, factual record of how the "Final Solution" began, continued and was finally terminated by the end of the war. He uses a more poetic, mosaic approach, moving according to rhythms only he understands among the only three kinds of faces we see in this film: survivors, murderers and bystanders. As their testimony is intercut with the scenes of train tracks, steam engines, abandoned buildings and empty fields, we are left with enough time to think our own thoughts, to meditate, to wonder. A: You see, once the gas was poured in, it worked like this: It rose from the ground upwards. And in the terrible struggle that followed - because it was a struggle - the lights were switched off in the gas chambers. It was dark, no one could see, so the strongest people tried to climb higher. Because they probably realized that the higher they got, the more air there was. They could breathe better. That caused the struggle. Secondly, most people tried to push their way to the door. It was psychological; they knew where the door was; maybe they could force their way out. It was instinctive, a death struggle. Which is why children and weaker people and the aged always wound up at the bottom. The strongest were on top. Because in the death struggle, a father didn't realize his son lay beneath him. Q. And when the doors were opened? A. They fell out. People fell out like blocks of stone, like rocks falling out of a truck. The images evoked by his words are unutterably painful. What is remarkable, on reflection, is that Muller is describing an event that neither he nor anyone else now alive ever saw. I realized, at the end of his words, that a fundamental change had taken place in the way I personally visualized the gas chambers. Always before, in reading about them or hearing about them, my point of view was outside, looking in. Muller put me inside. That is what this whole movie does, and it is probably the most important thing it does. It changes our point of view about the Holocaust. After nine hours of "Shoah," the Holocaust is no longer a subject, a chapter of history, a phenomenon. It is an environment. It is around us. Ordinary people speak in ordinary voices of days that had become ordinary to them. A railroad engineer who drove the trains to Treblinka is asked if he could hear the screams of the people in the cars behind his locomotive. A. Obviously, since the locomotive was next to the cars. They screamed, asked for water. The screams from the cars closest to the locomotives could be heard very well. Q. Can one get used to that? A. No. It was extremely distressing. He knew the people behind him were human, like him. The Germans gave him and the other workers vodka to drink. Without drinking, they couldn't have done it. Q. You never saw a train? A. No, never. We had so much work, I never left my desk. We worked day and night. Q. Did you see the gas vans? A. No . . . yes, from the outside. They shuttled back and forth. I never looked inside; I didn't see Jews in them. That was happening to my countrymen, and I realized that my life had become meaningless. (His eyes fill with tears.) Why go on living? For what? So I went into the gas chamber with them, resolved to die. With them. Suddenly, some who recognized me came up to me. . . . A small group of women approached. They looked at me and said, right there in the gas chamber . . .
Q. You were inside the gas chamber? A. Yes. One of them said: "So you want to die. But that's senseless. Your death won't give us back our lives. That's no way. You must get out of here alive, you must bear witness to our suffering and to the injustice done to us." And that is the final message of this extraordinary film. It is not a documentary, not journalism, not propaganda, not political. It is an act of witness. In it, Claude Lanzmann celebrates the priceless gift that sets man apart from animals and makes us human, and gives us hope: the ability for one generation to tell the next what it has learned.